COMING SOON! Release date September 17th! Pre-Order NOW! On 20 May 1941, Germany launched Operation Merkur (Mercury) the largest airborne invasion in history to capture the strategic island of Crete from the allies. . Markos is tasked by the allied commander to help evacuate the Hellenic King to the island’s south coast to be transported by the Royal Navy avoiding the forces of the Third Reich. When the young New Yorker Markos Androlakis visited the island of Crete in the summer of 1940 for a sabbatical he unwittingly put himself on a trajectory to test the fates of destiny. War soon engulfs the tiny peaceful nation of Greece and she does her best to hold off the Fascist hordes. Markos soon finds himself on the Greek and allied side and fights for survival and for the liberation of his ancestral homeland. 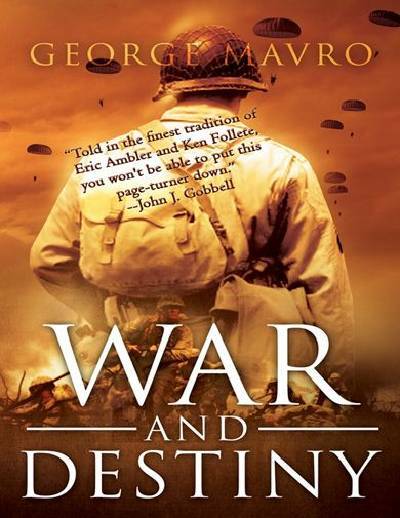 War and destiny is an epic tale of war, adventure, intrigue and love. On 20 May 1941, Germany launched Operation Merkur (Mercury) the largest airborne invasion in history to capture the strategic island of Crete from the allies. Markos is tasked by the allied commander to help evacuate the Hellenic King to the island’s south coast to be transported by the Royal Navy. Unbeknownst to Markos the German Reichsfuhrer Heinrich Himmler has dispatched a ruthless SS officer Georg Mueller to capture the King and return him to Germany. Markos manages to evacuate the king and journeys to Cairo where he is recruited into the US army and the COI which would soon become the OSS, Office of strategic services under the leadership of “Wild Bill Donovan.” Markos returns to America to help organize a cadre of Greek American agents to help the Greek resistance fight the ruthless and bloody Nazi occupation.